Today in Masonic History John Stewart Battle passes away in 1972. John Stewart Battle was an American politician. Battle was born in New Bern, Craven County, North Carolina on July 11th, 1890. He would earn an associates degree from Mars Hill College, a bachelor's degree from Wake Forest College (now Wake Forest University) and a law degree from the University of Virginia. 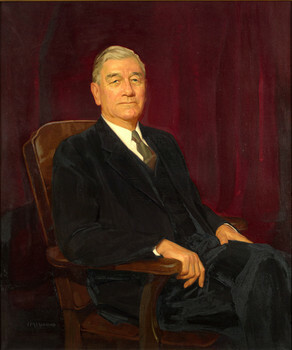 In 1929, Battle was elected to the Virgina House of Delegates. In 1934, he would be elected to the Virgina State Senate where he would serve until 1949 when he was elected as Governor of Virgina. He would serve as Governor from 1950 to 1954. Battle was a delegate at all of the Democratic National Conventions from 1948 to 1960, as well as the 1968 convention. At the 1952 convention, Battle and the Virginia delegation were threatened with expulsion from the convention if they refused to sign a loyalty oath stating that they would support any candidate that was nominated. Battle gave a speech to the convention and the threat of expulsion was prevented. At th 1956 convention Battle was proposed as a Presidential candidate, eventually losing to Adlai Stevenson. In 1959, President Eisenhower would appoint Battle to the United States Commission on Civil Rights, citing his moderate history on racism. Battle passed away on April 9th, 1972. Battle was a member of Charlottesville Lodge No. 5 in Charlottesville, Virgina.